Fort McNair is located on Greenleaf Point in Washington D.C. and was established over 200 years ago. The base falls under the jurisdiction of Joint Base Myer-Henderson Hall. 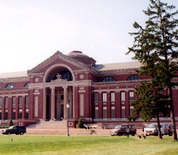 Tenant units include the National Defense University, the Inter-American Defense College and the United States Army Center of Military History. This Fort McNair directory features the critical info you’ll need to navigate through the many facilities and recreational opportunities available on base.